If you eat, sleep, & breathe golf, and are determined to shave strokes off your handicap, why not hit the green and practice in the comfort of your own home? Improve putt firmness & accuracy. 3 holes & raised incline for an extra challenge. Thick rubber matting and polyester material. Can be laid on any home surface without creasing. A quintessential piece of training equipment for any golfer, not just a luxury item! FORB Golf Balls are not included but are available to purchase from Net World Sports. Please store this mat indoors. HOME COMFORT: A professional golf putting aid that you can use within your very own home! 10ft (length) x 2.6ft (width) gives you plenty of room to work on your short game. 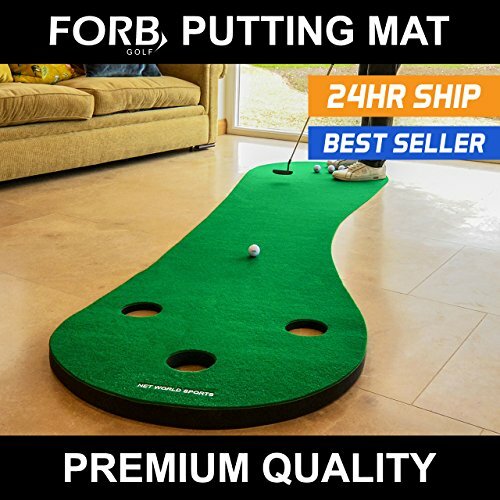 MASTER THE GREEN: Boasting 3 Holes and a 50mm thick EVA foam raised incline for an added challenge; our FORB putting mat helps improve putting stroke firmness along with accuracy. SUITABLE FOR ALL SURFACES: The mat can be laid on any home surface without creasing thanks to its 5mm thick rubber matting and high quality polyester material surface. ESSENTIAL TRAINING AIDE: Professional Golfers practice almost 24/7; now you can too with this fundamental training item. SUPER-FAST DELIVERY: Quick and safe delivery when you order with Net World Sports!